We want to show off your creativity! In an effort to showcase our newly released, completely customizable Share Buttons, we are holding a Twitter contest to see your most creative and thoughtful Web Designs, which utilize our customization features! We very recently upgraded our Shareaholic Share Buttons. And, by adding the option to customize the color of Share Buttons: their logos, background, and their transparency, we wanted to give you the option to match them perfectly to your site’s design! See our color customization guide here! Share a link or screenshot of your Shareaholic Share Button customizations with us on Twitter by tweeting us @Shareaholic, using #SHRButtonSwag! Examples we receive (with customized buttons) will be retweeted to our almost 100K followers showcasing your awesome content, sporting our buttons. 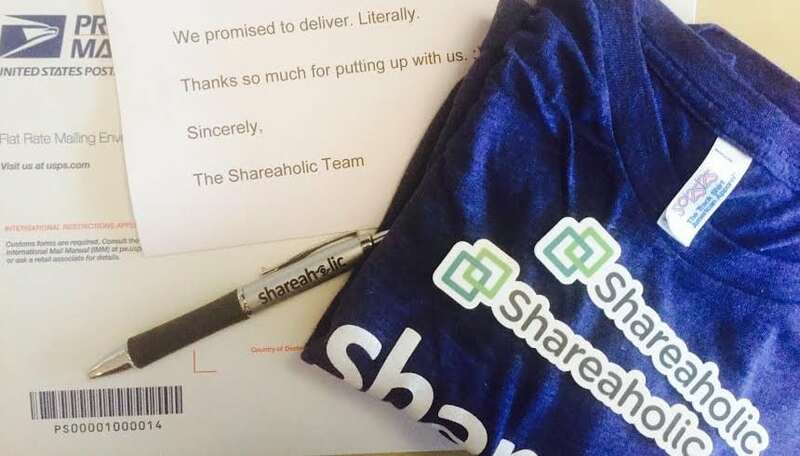 Submissions will also qualify you to win some Shareaholic Swag of your own, so get customizing! *Update* your examples are starting to pour in! Ps. We promote first come, first serve. The sooner you submit the sooner we can brag about you!